This book gives a brief overview of the „Patient Blood Management“ (PBM) concept and is addressed to health professionals as well as all persons generally involved into hospital management. 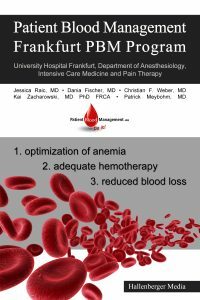 „Patient Blood Management“ (PBM) is a multidisciplinary, evidence-based approach to improve perioperative care. The concept is based on three pillars that target modifiable risk factors for adverse outcome: i) preoperative screening, diagnosis and treatment of anaemia, ii) blood-sparing techniques, and iii) adequate blood product utilization. The superior objective is to optimize patient outcome. Anaemia is common among hospital patients and an underestimated risk factor for blood transfusions, higher morbidity and mortality. Optimizing and preserving red cell mass before, during and after surgery can be achieved by a number of measures that can be implemented in EVERY hospital. These measures have high potential to improve patient outcome and to reduce costs both for allogeneic blood transfusions and for the treatment of the associated complications. Furthermore, due to the current demographical development, the offer of available blood products is most likely to decrease in the future whilst advances in modern medicine increase blood product demands, thus causing scarcity. Therefore, it is our duty towards society, patients and donors to use blood products wisely and only when absolutely necessary. Patient Blood Management is our strategy to face this challenge. The use of a PBM concept will be of benefit for patients, society, doctors and hospitals. This book, written by the key members of the University Hospital Frankfurt PBM project, aims to give a deeper understanding of the three pillars of the concept, and provide insights for undertaking further research as well as planning and implementing concrete operative measures.